The Dictionary<TKey, TValue> collection in C# is same as English dictionary. English dictionary is a collection of words and their definitions, often listed alphabetically in one or more specific languages. In the same way, the Dictionary in C# is a collection of Keys and Values, where key is like word and value is like definition. The Dictionary<TKey, TValue> class is a generic collection class in the System.Collection.Generics namespace. TKey denotes the type of key and TValue is the type of TValue. The following diagram illustrates the generic Dictionary class hierarchy. A Dictionary object can be assigned to a variable of IDictionary<Tkey, TValue> or Dictionary<TKey, Tvalue> class. In the above example, we have specified types of key and value while declaring a dictionary object. An int is a type of key and string is a type of value that will be stored into a dictionary object named dict. You can use any valid C# data type for keys and values. It is recommended to program to the interface rather than to the class. So, use IDictionary<TKey, TValue> type variable to initialize a dictionary object. Dictionary cannot include duplicate or null keys, where as values can be duplicated or set as null. Keys must be unique otherwise it will throw a runtime exception. Count Gets the total number of elements exists in the Dictionary<TKey,TValue>. IsReadOnly Returns a boolean indicating whether the Dictionary<TKey,TValue> is read-only. Item Gets or sets the element with the specified key in the Dictionary<TKey,TValue>. Keys Returns collection of keys of Dictionary<TKey,TValue>. Values Returns collection of values in Dictionary<TKey,TValue>. Add Adds an item to the Dictionary collection. Add Add key-value pairs in Dictionary<TKey, TValue> collection. Remove Removes the first occurance of specified item from the Dictionary<TKey, TValue>. ContainsKey Checks whether the specified key exists in Dictionary<TKey, TValue>. 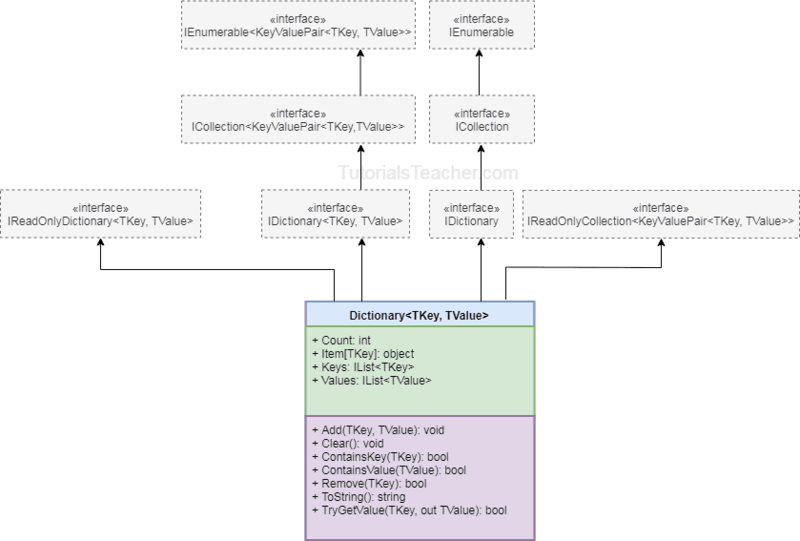 ContainsValue Checks whether the specified key exists in Dictionary<TKey, TValue>. Clear Removes all the elements from Dictionary<TKey, TValue>. Use Add() method to add the key-value pair in dictionary. Check whether a dictionary already stores specified key before adding a key-value pair. The IDictionary type instance has one more overload for the Add() method. It accepts a KeyValuePair<TKey, TValue> struct as a parameter. It can also be initialized using collecton initializer syntax with keys and values as shown below. Dictionary elements can be accessed by many ways e.g. foreach, for loop or indexer. Use foreach or for loop to iterate access all the elements of dictionary. The dictionary stores key-value pairs. So you can use a KeyValuePair<TKey, TValue> type or an implicitly typed variable var in foreach loop as shown below. Use for loop to access all the elements. Use Count property of dictionary to get the total number of elements in the dictionary. Dictionary can be used like an array to access its individual elements. Specify key (not index) to get a value from a dictionary using indexer like an array. Indexer takes the key as a parameter. If the specified key does not exist then a KeyNotFoundException will be thrown. If you are not sure about the key then use the TryGetValue() method. The TryGetValue() method will return false if it could not found keys instead of throwing an exception. Could not find the specified key. Dictionary includes various methods to determine whether a dictionary contains specified elements or keys. Use the ContainsKey() method to check whether a specified key exists in the dictionary or not. Use the Contains() method to check whether a specified Key and Value pair exists in the dictionary or not. Another overload of the Contains() method takes IEqualityComperer as a second parameter. An instance of IEqualityComparer is used when you want to customize the equality comparison. For example, consider the following example of a dictionary that stores a Student objects. In the above example, we have used StudentDictionaryComparer which derives IEqualityComparer to compare Student objects in the dictionary. The default comparer will only work with primitive data types. Use the Remove() method to remove an existing item from the dictionary. Remove() has two overloads, one overload method accepts a key and the other overload method accepts a KeyValuePair<> as a parameter. Use generic SortedDictionary collection if you want to sort a dictionary collection based on the keys. A Dictionary stores Key-Value pairs where the key must be unique. Before adding a KeyValuePair into a dictionary, check that the key does not exist using the ContainsKey() method. Use the TryGetValue() method to get the value of a key to avoid possible runtime exceptions. Use a foreach or for loop to iterate a dictionary. Use dictionary indexer to access individual item. Use custom class that derives IEqualityComparer to compare object of custom class with Contains() method.